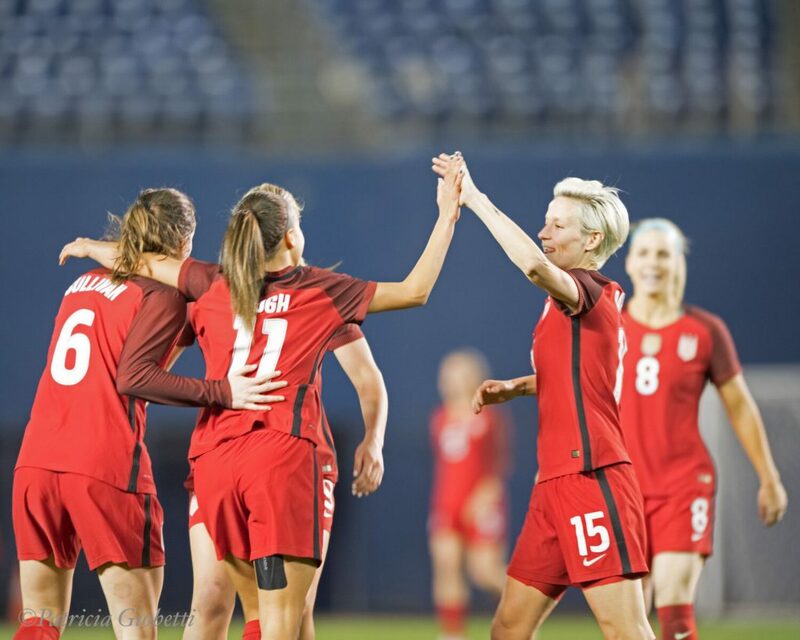 Earlier this evening, the United States held off England 1-0 to claim the SheBelieves Cup championship, a stark contrast from finishing the tournament in last place in 2017. While the U.S. will be much happier with the result, there are still lessons to be gleaned from the team’s overall performance in the tournament. Now that the champion has been crowned (and the gold confetti has fallen) let’s look at three things we can take away from the USWNT’s full SheBelieves campaign. We knew Tierna Davidson had serious chops on the international stage after her debut against Denmark in January, but when the 19-year-old was asked to anchor a new center-back partnership for every minute of the SheBelieves Cup, without the guidance of captain Becky Sauerbrunn, she performed with utmost poise throughout the week. Even when central partner Abby Dahlkemper had some touchy moments, and when the U.S. outside backs varied each match, Davidson showed herself to have a true talent at the position that held up against the best competition, with the U.S. only conceding one goal all tournament. The other major new face of the USWNT, Savannah McCaskill, performed admirably throughout the tournament, coming in off the bench against both France and England and infusing a work rate that the midfield desperately needed. She also showed an outward vocal personality that belied her international experience. For a U.S. midfield that has quite a few players who are good with the ball but relatively fragile, McCaskill is a breath of fresh air and an exciting potential asset to the squad. 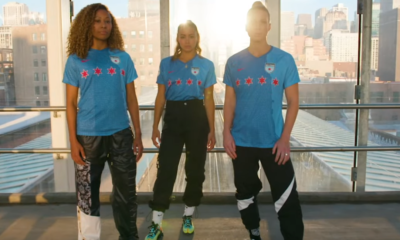 For a long time, the USWNT’s greatest asset has been their ongoing surge of talent, and with players like Mallory Pugh practically considered weathered veterans, the skill (and more importantly the ideas) coming from these new squad members are what is going to keep the Americans moving forward as a unit, and this tournament was as good a showcase for that talent as any. My esteemed colleague Dan Lauletta mentioned this after the first match against Germany last week, but it feels significant enough to be mentioned again: Alyssa Naeher is the Americans’ No. 1 goalkeeper going into the 2019 World Cup. After U.S. legend Hope Solo’s controversial departure in 2016, head coach Jill Ellis has always been very diplomatic in describing the competition between Naeher and long-time Solo backup Ashlyn Harris as ongoing, with a slight injury to Harris keeping Naeher ahead on the depth chart. 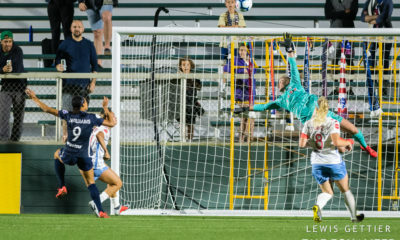 However, this week, Naeher’s full-90s as well as her performance have opened up what feels like the actual beginning of the post-Solo era of USWNT goalkeeping. Naeher was tasked this tournament with organizing her defense, as aforementioned without the help of stalwart Sauerbrunn, and had clearly been challenged by her coaches to make more concrete decisions in moving off her line against the quality attacks of Germany, France, and England. It was her distribution that unlocked the German defense for the lone goal in the U.S.’s first match, and she played sweeper-keeper as often as not against France. It was miles away a more impressive performance than her much more tentative Tournament of Nations last year, and it felt like the real passing of the torch. Naeher made saves when she needed to, helped out her young defense, and made concrete strives in the quantifiable weakest part of her game. The time for experience-building is over; this is her team moving forward. This has been an issue dating back to the 2015 World Cup championship run, and a quality of play that bit them at the 2016 Olympics and has continued to be an issue looking towards 2019: regardless of lineup, the U.S. has struggled to score against quality opposition. They won this tournament having scored three goals in as many matches, and had they fallen to England, they could’ve dropped to third behind France on goal differential. The fault for this could fall to a number of different places: injuries are certainly an issue. 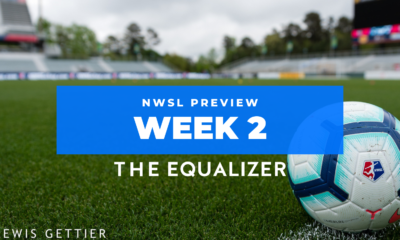 (Is there anyone as important to this team as Julie Ertz right now?) and the more defensive formations and quality of opponents are factors, but in all honesty, the U.S. formations haven’t helped themselves when it comes to offensive firepower. In the finale against England, Alex Morgan consistently made small but essential moves that helped the ball toward teammates that weren’t making the requisite runs to receive those opportunities. In general, Morgan did quality work all week, but the U.S. attack hasn’t been set up to reward inventiveness in the final third in a way that results in goals. The midfield remains a bit of a mess, with the contrasting styles of Andi Sullivan and Morgan Brian clashing with the plans the U.S. seems to have for Lindsey Horan and Carli Lloyd. And while Crystal Dunn did a heck of a job at left back vs. England, she’s a player that has been favored as a forward in recent years, and could excel if given some consistency as to her role for her national team. The same issues as always persist; the U.S. has the personnel to win every game. 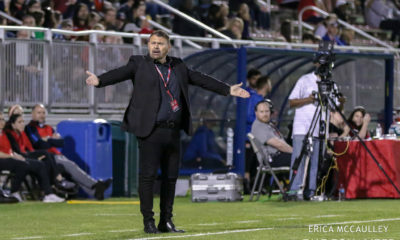 But that player quality and what’s happening tactically on the field are often at odds, and that allows for so much more guesswork and luck involved when the game gets down to the bottom line. This was a good tournament for the USWNT, but what they look like in the future is still very much in doubt.